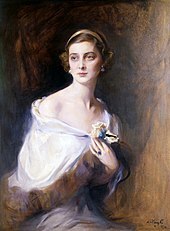 Princess Marina of Greece and Denmark, CI, GCVO, GBE (Greek: Πριγκίπισσα Μαρίνα της Ελλάδας και Δανίας; 13 December [O.S. 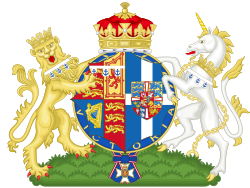 30 November] 1906 – 27 August 1968), later known as the Duchess of Kent, was a princess of the Greek royal house, who married Prince George, Duke of Kent, fourth son of King George V of the United Kingdom in 1934. They had three children: Prince Edward, Duke of Kent, Princess Alexandra, and Prince Michael. The Princess was widowed in 1942, when her husband was killed in a plane crash on active service. In later life, she carried out many royal engagements, including the independence celebrations for Ghana and Botswana. Princess Marina of Greece and Denmark, right, with her sisters Princess Olga of Greece and Denmark, left, and Princess Elizabeth of Greece and Denmark, center. Princess Marina was born in Athens, Greece, on 13 December 1906. Her father was Prince Nicholas of Greece and Denmark, the third son of George I of Greece. Her mother was Grand Duchess Elena Vladimirovna of Russia, a granddaughter of Emperor Alexander II of Russia. She was the youngest of the couple's children. One of her paternal uncles was Prince Andrew of Greece and Denmark, the father of Prince Philip, Duke of Edinburgh. She was baptised near the end of 1906, and her godparents were: King George I of Greece (her paternal grandfather); King Edward VII of the United Kingdom (her great-uncle by marriage); Mary of Teck, the Princess of Wales; Prince Andrew of Greece and Denmark (her paternal uncle); Grand Duke Boris Vladimirovich of Russia (her maternal uncle); and Grand Duchess Victoria Fyodorovna of Russia (her maternal aunt). Marina spent her early years in Greece, and lived with her parents and paternal grandparents at Tatoi Palace. Along with her sisters, she was raised to be devout and religious, which was encouraged by her grandmother, Queen Olga of Greece. Marina's family travelled outside of Greece often, especially during the summer months. Her first recorded visit to Britain was in 1910 after the death of her godfather, Edward VII. She officially met her other godmother and future mother-in-law, Mary of Teck (then Queen Mary), who treated Marina and her sisters like her own children. The Greek royal family was forced into exile when Marina was 11, following the overthrow of the Greek monarchy. They later moved to Paris, while the Princess stayed with her extended family throughout Europe. In 1932 Princess Marina and Prince George (later the Duke of Kent), a second cousin through Christian IX of Denmark, met in London. Their betrothal was announced in August 1934. Prince George was created Duke of Kent on 9 October 1934. Marina's engagement ring was made out of a "square-cut Kashmir sapphire set in platinum with a baton diamond on either side". On 29 November 1934, they married at Westminster Abbey, London. The wedding was a grand affair, as it had been more than ten years since the last royal wedding with Prince Albert, Duke of York, and Lady Elizabeth Bowes-Lyon. The wedding of Prince George and Princess Marina was the first royal wedding ceremony to be broadcast by wireless, and with the use of other technology, such as microphones—the control room was located underneath the Unknown Warrior's tomb of Westminster Abbey. The service was broadcast locally and abroad to other nations, and loudspeakers allowed spectators from outside the Abbey to hear what was going on. The wedding was followed by a Greek ceremony in the private chapel at Buckingham Palace, which was converted into an Orthodox chapel for the ceremony. This was the first time this had been done since the wedding of Princess Marina's great-aunt, Grand Duchess Maria Alexandrovna of Russia to Prince Alfred, Duke of Edinburgh, during the reign of Queen Victoria. The wedding was the most recent occasion on which a foreign-born princess married into the British Royal Family. 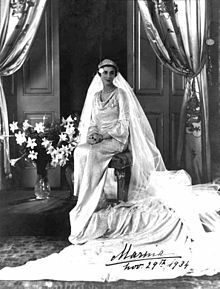 The bride's gown was in white and silver silk brocade, designed by Edward Molyneux, and worked on by a team of seamstresses including, at Marina's request, Russian émigrées. The dress featured "sheath silhouette, a draped cowl neckline, trumpet sleeves, and a wide train." A tiara, given to her as a wedding gift, secured her tulle veil. Her eight bridesmaids were her first cousins, Greek princesses Irene, Eugenie and Katherine, her maternal first cousin Grand Duchess Kira Kirillovna of Russia, her first cousin once removed Princess Juliana of the Netherlands, her husband's niece Princess Elizabeth of York, her husband's cousins the Lady Iris Mountbatten and Lady Mary Cambridge. The Royal School of Needlework made a quilt as a wedding gift for Princess Marina and the Duke of Kent. The Duke and Duchess set up their first home at 3 Belgrave Square, close to Buckingham Palace. She became a patroness of several organizations and charities, including the Elizabeth Garrett Anderson Hospital, the Women's Hospital Fund, and the Central School of Speech and Drama. She would continue to support these charities and institutions for the rest of her life. She became very close to her mother-in-law, Queen Mary, with whom she would usually spend time while her husband was off performing his own royal duties. Prince Edward, Duke of Kent (9 October 1935) he married Katharine Lucy Mary Worsley on 8 June 1961. They have three children. Princess Alexandra, The Hon. Lady Ogilvy (25 December 1936) she married Rt. Hon. Sir Angus James Robert Bruce Ogilvy, son of David Lyulph Gore Wolseley Ogilvy, 12th Earl of Airlie and Lady Alexandra Marie Bridget Coke, on 24 April 1963. They had two children. Prince Michael of Kent (4 July 1942) he married Marie Christine von Reibnitz on 30 June 1978. They have two children. The Duke of Kent was killed on 25 August 1942, in an aeroplane crash at Eagles Rock, near Dunbeath, Caithness, Scotland, while on active service with the Royal Air Force. The Duchess, according to royal biographer Hugo Vickers, was "the only war widow in Britain whose estate was forced to pay death duties". During World War II, Marina was trained as a nurse for three months under the pseudonym "Sister Kay" and joined the civil nurse reserve. After her husband's death, the Duchess of Kent continued to be an active member of the British Royal Family, carrying out a wide range of royal and official engagements. She was the president of the Wimbledon All England Lawn Tennis and Croquet Club for 26 years. 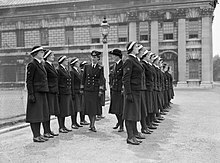 She was also the president of the Royal National Lifeboat Institution from 1943 until her death and was awarded the RNLI's Gold Medal in 1967 to mark this contribution. One of her first cousins was Prince Philip (later the Duke of Edinburgh), who married her niece, the future Queen Elizabeth II, in 1947. In 1947, Princess Marina visited Greece and Italy. 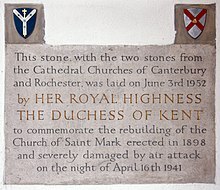 In June 1952 the Duchess laid the foundation stone of the new St Mark's Church in Bromley, London, which had been damaged in the war. In 1952, the Duchess also visited Sarawak (then a British Crown Colony), where she laid the foundation stone of the Cathedral of St. Thomas in Kuching. She also visited the Batu Lintang camp, a Japanese internment camp during World War II which had been converted to a teacher training college, and the town of Sibu, where she opened the outpatient department of the Lau Kheng Howe Hospital. In March 1957 when the Gold Coast (later Ghana)—gained independence from Britain, the Duchess of Kent was appointed to represent the Queen at the celebrations. Fifty years later, at the 50th Anniversary of Ghana's Independence, it would be her son, Prince Edward, Duke of Kent, who would be appointed by the Queen to represent her. Marina earned a place in the International Best Dressed List Hall of Fame in 1960 together with the Princess of Monaco, Patricia Lopez-Willshaw and Merle Oberon. In 1964, the Princess took an extensive tour of Australia and officially opened Gladesville Bridge in Sydney. In September 1966, when the British Protectorate of Bechuanaland became the new Republic of Botswana, the Princess was appointed again to represent the Queen at the celebrations. The main public hospital in Gaborone, the new Botswana's capital, is named "Princess Marina Hospital". She served as the first Chancellor of the University of Kent at Canterbury from 1963 until her death from a brain tumour at Kensington Palace at 11.40 am on 27 August 1968, aged 61. Funeral service for the Princess was held at the St. George's Chapel on 30 August. She was buried in the Royal Burial Ground, Frogmore. Her funeral was the final royal ceremony attended by her brother-in-law, the former Edward VIII. Princess Marina House, a facility of the Royal Air Force Benevolent Fund at Rustington. Princess Marina Sports Complex, Rickmansworth. The Kinks recorded "She's Bought a Hat Like Princess Marina" for their 1969 album Arthur (or the Decline and Fall of the British Empire). The song was written by Ray Davies. In 2017, Clare Holman portrayed Princess Marina in the season 2 finale of The Crown. ^ "Genealogy of the Royal Family of Great Britain". Archived from the original on 28 October 2009. Retrieved 28 October 2009. ^ a b c "Marina won Britain's heart". Evening Times. 27 August 1968. Retrieved 17 July 2013. ^ a b "Prince George son of King, to be married". The Montreal Gazette. London. CP and AP. 28 August 1934. Retrieved 24 July 2013. ^ a b c d "Princess Marina called luckiest girl in the world by relatives". The Milwaukee Journal. Athens. AP. 23 November 1934. Retrieved 24 July 2013. ^ a b c "Marina, a tragic but well-loved Princess". The Sydney Morning Herald. London. 28 August 1968. Retrieved 24 July 2013. ^ "Yvonne's Royalty Home Page: Royal Christenings". users.uniserve.com. Retrieved 25 June 2017. ^ "No. 34094". The London Gazette. 9 October 1934. p. 6365. ^ "Princess Marina's Ring (1934)". The Guardian. The Court Jeweller. Retrieved 15 November 2018. ^ a b "King and Queen see rehearsals". The Sydney Morning Herald. 29 November 1934. Retrieved 24 July 2013. ^ a b c "Princess Marina's Gown". Royal Order of Sartorial Splendor. 31 October 2012. Retrieved 8 October 2018. ^ "The wedding of Prince George, Duke of Kent and Princess Marina, Duchess of Kent". National Portrait Gallery, London. ^ "Princess Marina's quilt". British Pathé. Retrieved 15 June 2013. ^ Hennessy, Sue (2010). Hidden Depths: Women of the RNLI. The History Press. pp. 140–1. ISBN 9780752454436. ^ "Duchess Of Kent In Greece (1947)". British Pathé. YouTube. 13 April 2014. Retrieved 25 March 2018. ^ "The Duchess Of Kent Visits Italy (1947)". British Pathé. YouTube. 13 April 2014. Retrieved 25 March 2018. ^ Robin Waldron. "St Mark's History" (PDF) (2011 ed.). St Mark's Church Bromley. Retrieved 6 April 2015. ^ Ultimate Style - The Best of the Best Dressed List. 2004. ISBN 2 84323 513 8. ^ "Princess Marina's Visit To Australia AKA Princess Marina In Australia (1964)". British Pathé. YouTube. 13 April 2014. Retrieved 25 March 2018. ^ Luscombe, Stephen. "The British Empire, Imperialism, Colonialism, Colonies". www.britishempire.co.uk. Retrieved 25 June 2017. ^ Debrett's Peerage and Baronetage. Kelly's Directories. 2000. ISBN 978-0-333-54577-5. ^ "Five Queens at funeral of Duchess". The Windsor Star. Windsor. Reuters. 31 August 1968. Retrieved 24 July 2013. ^ "1968: Princess Marina laid to rest". BBC News. 30 August 1976. Retrieved 15 June 2013. ^ Ziegler, Philip (1991). King Edward VIII: The official biography. New York: Alfred A. Knopf. ISBN 0-394-57730-2, pp. 554-556. ^ "Royal Air Force Benevolent Fund". About Princess Marina House. Retrieved 15 June 2013. ^ "Overview - NHS Choices". Princess Marina Hospital. 10 August 2010. Retrieved 17 July 2013. ^ "Princess Marina Sports Complex". We Love Rickmansworth. Archived from the original on 8 January 2009. Retrieved 9 April 2012. ^ a b "She Bought A Hat Like Princess Marina". The Kinks. Retrieved 24 July 2013. ^ "Viewing Page 3729 of Issue 34406". London Gazette. 8 June 1937. Retrieved 9 April 2012. ^ "Wedding of Juan Carlos of Spain and Sophia of Greece". Archived from the original on 21 July 2015. Retrieved 25 June 2017. ^ "Reply to a parliamentary question" (PDF) (in German). p. 214. Retrieved 18 October 2012. ^ "SAINTANNA.RU - Св. Екатерины". saintanna.ru. Archived from the original on 13 March 2012. Retrieved 25 June 2017. ^ "London Honours Duchess Aka City Honours Duchess Of Kent (1952)". British Pathé. YouTube. 13 April 2014. Retrieved 25 March 2018. Wikimedia Commons has media related to Princess Marina, Duchess of Kent. This page was last edited on 18 April 2019, at 16:40 (UTC).